The Boring Company’s first tunnel being dug under Los Angeles is almost complete, Elon Musk said in a tweet Thursday. And pending regulatory approval, Grimes’s boyfriend plans to offer free subterranean rides to the public in a few months. Musk’s announcement was accompanied by a time-lapse video on Instagram showing a round-trip journey through the tunnel. The two-mile test tunnel underneath SpaceX’s headquarters in Hawthrone, California, is a proof-of-concept for an underground public transportation system which aims to transport passengers and vehicles beneath congested roadways on autonomous electric skates. The skates will theoretically transport between 8 to 16 passengers, or one passenger vehicle, along magnetic rails at speeds of up to 124 mph (200 km/h). In August, Musk shared a photo of a Tesla Model S in the same Hawthorne tunnel. (Questions were recently raised as to whether the second tunnel proposed by Musk would be wide enough to accommodate the all-electric vehicle.) 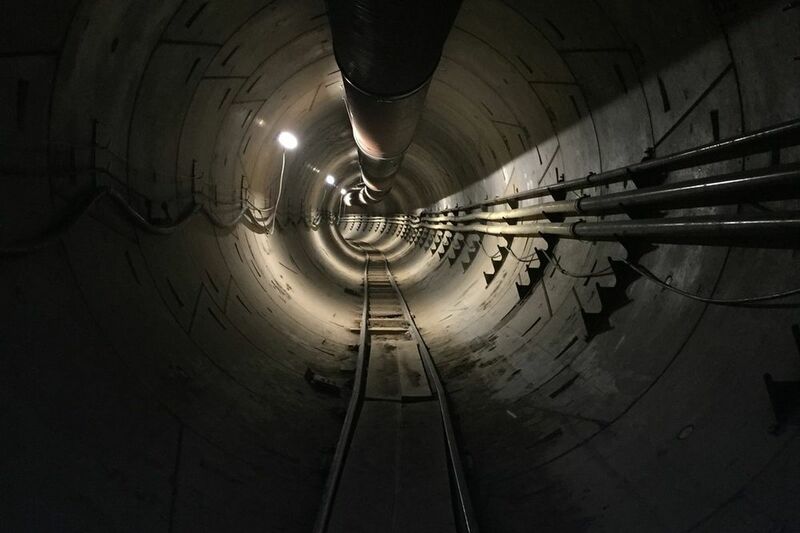 The Boring Company has four underground transportation projects in the works, including the Hawthorne test tunnel, Los Angeles, Washington, DC, and Chicago. Musk has previously tweeted about his frustration with traffic congestion in Los Angeles, remarking in December 2016 that “Traffic is driving me nuts. Am going to build a tunnel boring machine and just start digging.” Musk has also stated his hopes to build a hyperloop between Los Angeles and San Francisco next year, which he said would feature pressurized pods in near-vacuum tunnels that travel faster than a jetliner. In December, Musk’s company received a $266,000 sales tax exclusion from the state of California to build a new, fully automated concrete rings manufacturing facility. Once its up and running, the Boring Company says the $3 million facility will produce concrete for its tunnels four times faster than existing processes, and with 20 percent less energy and air pollutants. The company also recently announced plans to sell “interlocking bricks” made from the rock that its tunnel-creating machines excavate from the ground. In other words, think Lego, Musk says, except giant, heavy, and made of earth.